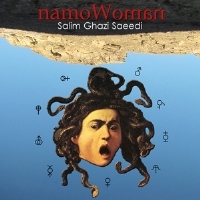 Salim’s description of his newest work ‘namoWoman’ says this challenges the concepts of dual sexuality, dual conceptuality and equal temperament musicality, harmoniously. I’ve been following Salim’s musical output for quite a few years and each recording has impressed me to various degrees. I predicted big things for him and it is no disappointment to hear this remarkable disc in its full glory. Each release has been a new journey, a new overturned leaf, and a satisfying listening experience all its own. For me, this one ranks as his most adventurous and fully realized. Nothing is conventional and not a thing is taken for granted. This new work is all expansive. Still present are the hyper elements. 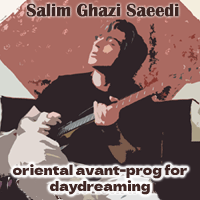 While it may give some listeners the feel of a too mechanical sound, I believe Salim uses the more frantic aspects to display a precise and tight rhythm section. The guitar work is perfect and flowing. Track 2 (nam) is in the RIO genre not unlike a combination of UZ, Art Zoyd , adding a dose of Richard Pinhas, some oddly compatible eastern motifs and Canterbury jazz. A gem of a composition. This one tells a story in under five minutes. Track 3 (amo) has a creeping Zeuhl sound and much less hyper or rushed. This one takes its time and breathes. In its beauty it carries a Fripp and Pinhas halo, plus some of the aforementioned chamber RIO. Complex in arrangements and often mind-blowing in the guitar department, ‘namoWoman’ takes time and thought to access the full impact. If I’ve said it once, I’ve said it a hundred times; most progressive music of any genre needs multiple listens to absorb. There is no wallpaper aural candy here. Track 4 (moW) is all best appreciated by sitting back with the physical CD on a nice big stereo, in an easy chair, alone and listened to like you would read a book. Track 5 (Woman) also takes its time to develop. Salim is at his best on the slower tempos, as his ideas are many. This allows the pace to be like a beeswax candle versus a paper match. It’s a sweet pause to direct the passion into a big space. The tortoise wins every time over the rabbit. Track 6 (Wom) is more brilliant Zeuhl inspired music with a groove just at the perfect moment. Salim’s radar is superb! Track 7 (oma) is like the Titantic in ice, this crawls with open abandonment. The remaining music has a perfect balance of dark bass, crunchy guitar, acoustic piano, drums, and compressed lead with many dimensions. Like a Haunted shut down circus, night in the desert, a sweat lodge, an unknown fly-by-night noir nightclub, or a midnight sleep in an endless meadow under star-filled skies: the atmospheres are sometimes interchangeable. This is recommended listening.